For road bikes, a popular spot is the Blue Ridge Parkway. 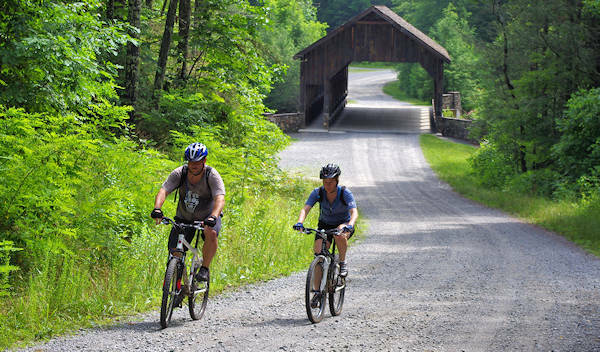 Read some great tips about biking on the Blue Ridge Parkway. Also, read a biker's journal of his ride of the entire Parkway. There are plenty of country roads to explore in the North Carolina mountains. In Asheville, Carrier Park has a paved track for biking loops and is located along the 2.8-mile French Broad River Greenway in West Asheville at the French Broad River Park. It's part of the Wilma Dykeman RiverWay Plan, a major urban waterfront redevelopment project. Our favorite paved greenway near Asheville is the Point Lookout Greenway Bike Trail, a very scenic 3.6-mile paved greenway that climbs 900 ft. in elevation. If you do not bring your bike, you can rent road and mountain bikes in town at the Adventure Center of Asheville. For a convenient place to rent and service bikes near Tsali Recreational Area, go to Nantahala Outdoor Center. Their bike shop is only ten minutes from Tsali and they have their own Flint Ridge Trail with great views of the Nantahala Gorge. As you may guess, mountain biking is big in the Asheville area of the North Carolina mountains. Just south of the city, you will find a variety of mountain bike trails at the Bent Creek Experimental Forest and the NC Arboretum next door. The Pisgah Forest District’s other popular biking areas include Bent Creek, near Asheville; Trace Ridge, near the town of Mills River; Davidson River, near Brevard; and South Mills River, near the town of Pisgah Forest. About an hour west of Asheville is the nationally-known Tsali Recreation Area. Near downtown, go to the Asheville Adventure Center to the Kilo Bike Park. Follow the training route of Lance Armstrong. Beech Mountain is a biker's mountain, offering something for everyone. The Adventure Trail Park is a series of trails on both public and private land, maintained by the Town of Beech Mountain, that includes single track, double track, technical downhill runs, freeride areas, fire roads and old unmaintained gravel roads. USA Cycling chose Beech Mountain Resort as the site of the Mountain Bike Gravity National Championships. The resort, the highest ski area in eastern North America, is developing the course and enhancing its lifts with the goal of creating an advanced facility for all mountain bike enthusiasts. 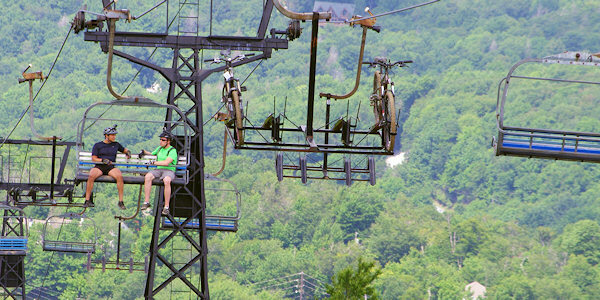 On summer weekends, ride the chairlift up and bike down! And it's always cooler at this high elevation. 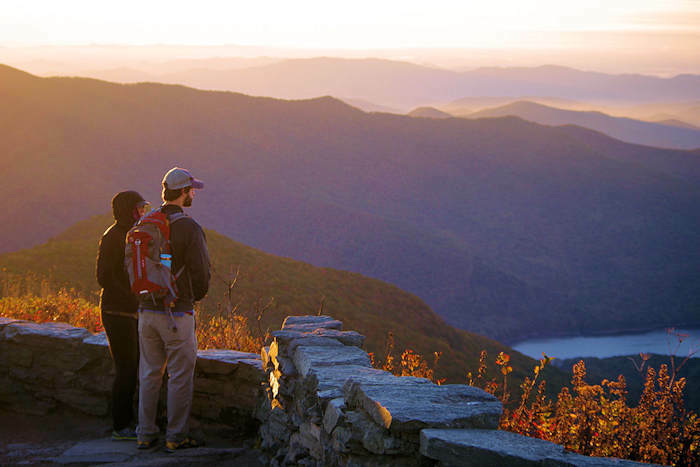 See our Beech Mountain Guide. The most popular mountain biking area is Tsali Recreation Area in Nantahala National Forest with 40+ miles of trails near Bryson City. See our Tsali Biking Guide. Located in Asheville near the NC Arboretum, Bent Creek's collection of trails is great for all levels of mountain bike riders, with easier flat trails to trails with large climbs and technical sections. Bent Creek is popular for after-dinner rides, because it is just a few minutes' drive from downtown Asheville. Lake Powhatan has a great campground. See our Bent Creek & Lake Powhatan Guide. DuPont State Recreational Forest - Our Favorite! Bike to waterfalls in DuPont State Forest, fast becoming one of the leading mountain bike destinations in Western North Carolina. This forest offers 86 miles of trail, nearly all of which is open to both equestrians and mountain bikers. 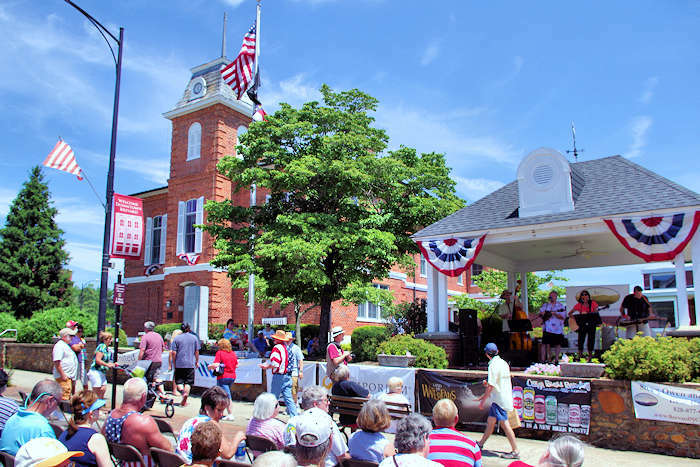 DuPont offers everything from gentle forest roads to exciting single track, with an impressive variety of scenic attractions located only minutes apart. Ride across a granite summit at Cedar Rock (pic above) or gentle dirt roads to Bridal Veil Falls (pic at top of page). The Gunion Farm area in the forest (home to Wintergreen Falls) is a biker's favorite with a network of trails. New bike trails have opened in Lake Lure at Buffalo Creek Park. The current trail snakes upward in a 3.5-mile loop that climbs approximately 500 ft. through forest terrain and boulder fields. Continue 8 more miles to Eagle Rock. More to come soon. 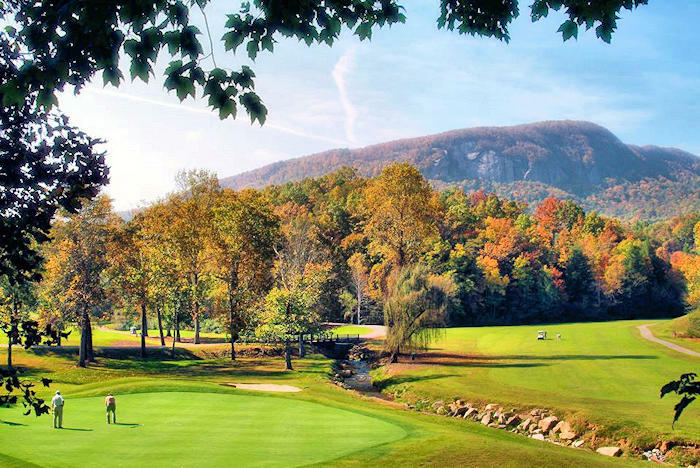 Read more in our Lake Lure Guide. About 14 miles from Bent Creek, find an interconnecting trail system in Pisgah National Forest that creates multiple loops to ride on easy to very challenging trails such as Trace Ridge, Fletcher Creek. Laurel Mountain, Pilot Rock and Spencer Branch. Located near Mills River, a quick drive south of Asheville. Drive NC 280 past the Asheville airport and take a right on North Mills River Road (at Ingles grocery store) and follow signs to North Mills River Recreation Area. Turn right on Wash Creek Road for two miles. Turn left on a gravel road and go a half-mile to the Trace Ridge trailhead and parking. Get details on an 8.4-mile loop ride. If you are visiting Biltmore, take along your bike and try out their mountain biking trails - from easy to difficult. Read more. 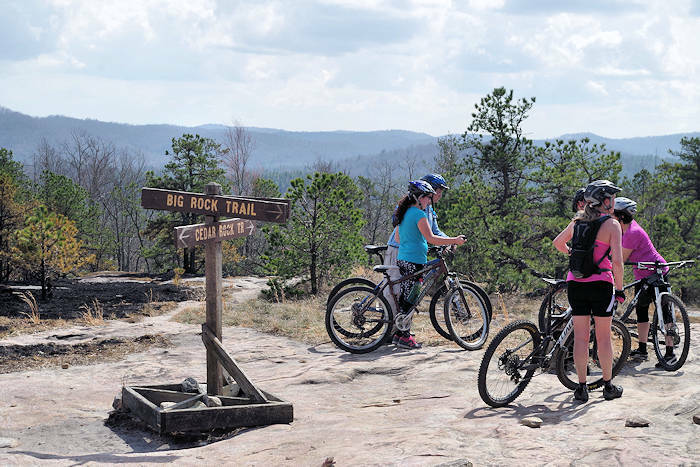 This mountain bike guide service specializes in professionally-guided trips in Pisgah National Forest and DuPont State Forest, customized to individual tastes and ability levels. Half, full and multi-day trips include a snack and lunch. Experienced and trustworthy guides create rides focusing on downhills, single-track or climbing. Find mountain biking heaven in the Nantahala National Forest with 40 miles of trails overlooking Fontana Lake. Located near Bryson City, where you can find bike rentals and supplies. Rent a mountain bike at NOC’s Tsali Bikes on the Nantahala River! We’re just 10 minutes from Tsali, or ride across the river on our own Flint Ridge Trail. Service and repairs, bike sales. This outdoor playground, just five minutes from downtown, has Kolo Bike Park with five miles of purpose-built trails on rolling terrain, designed for all skill levels. Catch some air at Kolo's pump track and jump line. Bring your bike or rent a mountain bike for use here or any of the North Carolina bike trails. Combine your ride with a zip line canopy tour and a treetops adventure - all on one property. Hike, bike and golf in the highest town in eastern America, and enjoy cool temperatures all summer long. Their 20-mile trail system is open year-round. Ride through downtown on a wicked-cool 13-person pedal powered (motor-assisted) contraption like no other. Imagine riding your bike sideways, hanging out at your favorite pub on wheels. Pubcycle is a BYOB activity, so get your brew on! See Asheville the best way possible - by electric bike! Get up close to the must-see spots, meander down beautiful greenways and catch stunning views. Electric-assist bikes make Asheville’s hills easy and fun. Tours daily, departing from their downtown location. Electric bike rentals also. May: Bike a very challenging 102-mile supported route in May from Spartanburg, South Carolina, to the top of Mt. Mitchell. You climb a cumulative of 11,000+ vertical feet (6,600 feet in the last 24 miles)! You can bike the entire route or take ride the Assault on Marion, a 78-mile ride that stops before the steep climb to the top. Go to their website. July: Gran Fondo National Championship Series® (GFNCS) benefits Friends of the Smokies. The Asheville Gran Fondo is a European-style cycling challenge that takes bicycle racing to the next level through a hybrid of competitive road racing and casual century rides, designed for cyclists of every skill level. Courses cover 30, 60 and 100-mile journeys with four timed sections, fully stocked aid stations along the route, food and beverages at the finish, and prizes. Go to their Web site. August: 12-70 mile routes. Go to their Web site.